Peli Peli is a South African fusion restaurant with two locations: one in the Galleria and the other in Vintage Park. The one I dined at is conveniently located in the Galleria Mall. The storefront is quite small, but in no way easy to miss. The wall behind the hostess counter is beautifully adorned with ambient lighting and a tall tree with a curved wall behind it. When we arrived, we were asked if we would prefer to sit in the main dining room, on the patio, or in the bar area to enjoy the happy hour. Making the obvious choice, we were seated at a table in the bar area looking out to the patio. The interior décor is something to be admired as well! For my lunch, I enjoyed the Flavors of South Africa Trio. 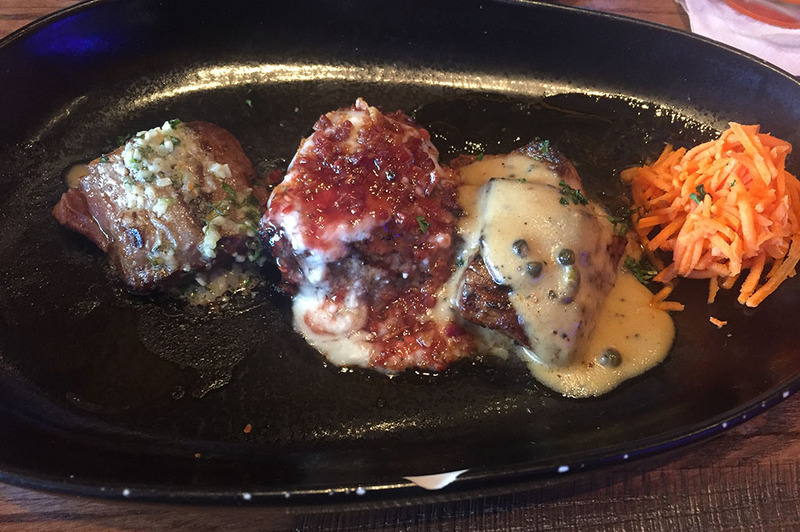 It had three melt-in-your-mouth filet medallions, each with a different sauce: Huguenot, Madagascar Peppercorn, and Garlic Herb Butter. Each one was unique, flavorful and complemented the filet in a different way. The lunch entrees also come with a choice of two sides. I chose the perfectly seasoned Roasted Red Potatoes and the crisp and buttery French Green Beans. My fiancé ordered the South African Kingklip & Scallops. This is served with pan-seared Kingklip over sautéed baby spinach topped with shredded scallops. Encompassing all of this was a butter cream sauce and a mix of herbs unique to Peli Peli. His chosen sides were the Roasted Red Potatoes and the South African Rice. 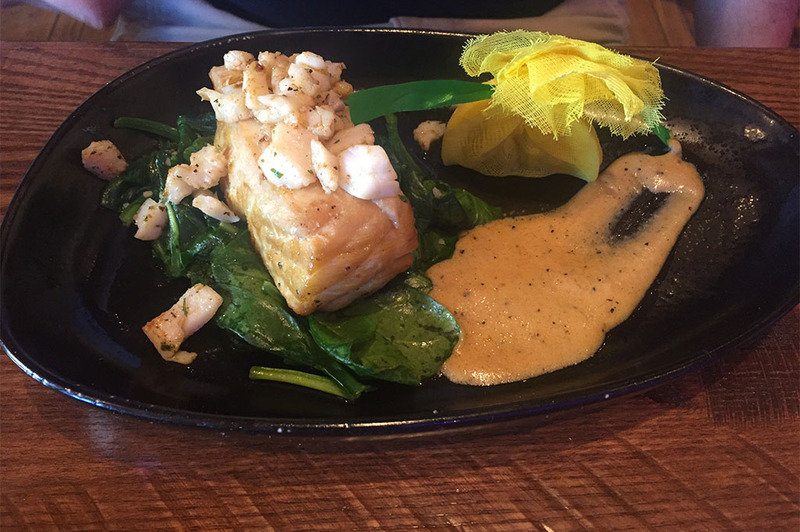 I am usually not a fan of fish, but one bite of the Kingklip made me decide that I will be ordering it the next time I go. One bite was not enough! All in all, Peli Peli is a great date night or business restaurant with a phenomenal atmosphere! Even just looking around and enjoying the art that is the interior décor was a pleasant experience. However, the food is something you will have dreams about! I had never experienced South African cuisine before; but one bite and you’ll be transported. I will definitely return to Peli Peli!